Today’s post is an unanticipated part III in my series Crossing Over, on writing and publishing an academic book that aims to be a “crossover” title with a popular audience. Part I can be found here, “What is my book about?”, and Part II here, “Will I ever publish this book?” Many thanks to those of you in the comments on those posts who encouraged me to write a Part III. I hope to hear from the rest of you as to the writers and titles you see as your historical and literary models. One of the challenges in writing The Many Captivities of Esther Wheelwright (Yale University Press, forthcoming 2016) was the fact that her life is very eventful early in childhood and adolescence, and then again in old age–a reversal of most biographies, which tend to focus on the adult years of a subject’s life, and offer only scant attention to their youths and their decline in old age. But while her childhood was very eventful–taken captive at age 7, brought to New France at age 12, and announced her intention to become a nun at age 14–most of it before she enters the Ursuline convent as a student at age 12 is only very lightly documented. For the first half of my book, I had just the story of a little girl, only occasionally told or remembered by an adult over the past three hundred years. How could I tell her story? 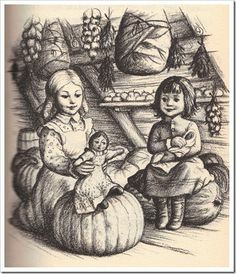 Many of us who read this book as a child are left with indelible impressions of the Ingalls girls’ life and times in Wisconsin in the 1870s: the inflated pig bladder balloon; the delicious roasted pigtail; the dusty, prosperous smell up of the cabin rafters where the dried and preserved food was stored; the grated carrot used to color Ma’s butter in winter; poor Susan, the corncob doll upstaged by Charlotte, the glamorous rag doll Laura gets for Christmas; Ma’s strawberry-patterned delaine, with its mouth-watering dark red buttons on the bodice; and the maple sugar candy poured on fresh snow. As a young reader, I also liked–and still appreciate–how Laura is always being told to sit still, play quietly, be ladylike, and how this is always presented as advice she’s straining against. I think this is something that might be a truth universally understood about girlhood: there’s always someone telling you no, because you’re a girl. But the feeling of warmth and plenty that Ingalls evokes is really inappropriate to describing the experiences of the Wabanaki at the turn of the eighteenth century. Allies of the French and hosts of several Jesuit missionaries, the Wabanaki had as a consequence suffered from two decades of warfare with the English. The Norridgewock Wabanaki were burned out of their village in 1705, and spent most of the rest of the next decade fleeing the English from mission town to mission town in what’s now the Canadian provinces of Quebec and New Brunswick, and the U.S. state of Maine. People whose primary concern is staying one step ahead of the enemy aren’t necessarily focused on getting corn into the ground or sticking around for the harvest. As I discovered, the Wabanaki living in mission towns at the turn of the eighteenth century were starving, with the women and children suffering and dying of scurvy. These were stories that the Little House model couldn’t help me with, edited as they were by Rose Wilder Lane, Laura’s libertarian-leaning daughter who shaped many of Laura’s books to make the Ingalls family seem more self-sufficient than they really were. This year, I’ve decided to make storytelling a central part of my graduate readings course on early American history. I’ve also assigned both Little House in the Big Woods and Louise Erdrich’s The Birchbark House, the inaugural novel of a series that was conceived as a Native American response to the Little House series and its white pioneer nostalgia. Erdrich opens in The Birchbark House with trauma, and doesn’t flinch from telling the story of Ojibwa survival in the nineteenth century. Like Little House in the Big Woods, Erdrich organizes her book around the four seasons, strategies for getting food and shelter, and dealing with the pressures of colonialism exerted by families like the Ingalls. It’s good advice. I just might take it. What have we got to lose? Or more importantly, think of what we might gain! I was never a huge Little House fan, but I love your thinking about the structure of the books as a way of talking about childhood. Is there any model for talking about old age? I don’t think we have good narratives for age. . . There is also the question of historical models — how do you tell a story where many readers will lack significant pieces of the context? Many of us are inclined to do an information dump in the introduction (as my editor friend said to me, bad habits that scholars have). What I learned from Robert Harms’ The Diligent was how to wait till people needed to know something to add it in. . .
Yes-avoid the info dump if you can! I don’t know if I’ve settled on a good model for writing about old age. Nuns and other devout people have an advantage, in that their values & sense of self-worth aren’t linked to youth & beauty. It’s a bonus not to have your sense of health and worth based in large part on your fertility or fecundity. In fact, among many groups of religious people in the modern era, age is itself seen as evidence of blessing or of some kind of spiritual power. A colleague of mine working in African American history in the 18th & 19th centuries (who is himself writing about elders), Fred Knight, really helped me to see Esther’s old age not as a loss, but as a time in which she came into her own power & authority. I love this idea so much. Though I’m not a historian, I’ve long recognized that it’s the materiality of the past that excites me–it’s probably why I always gravitated toward the nonfictional, often “non-literary” texts that bored everyone else in my classes: they *weren’t* detachable from their immediate context like well-wrought urns or whatever, but conjured up the actual experience of reading & the world around the readers in a way I found vivid and exciting. And now I like to believe that, as with you, it all began with *Little House in the Big Woods*, which I felt much the same way about and remembered much the same things. Are those pumpkins and watermelons they’re sitting on??? Oh, and still annoyed that your blogge banner blocks the Elvgren! They’re pumpkins & other winter squash. There’s a whole bit about how good the attic smells, with all of the dried and preserved food up there, and how warm it was to play up there. Why not sit on a pumpkin? On the placement of the banner: scroll down a little bit and you can see their pretty faces. The banner lightens up pretty quickly. At first I too thought it was a bug, but I kind of like the mystery it imparts. I love The Little House books, too! I made my parents take me to the SD and MO home sites (and returned to the MO site years later), because fan girl. I haven’t read it yet myself, but have you seen Prairie Girl, Wilder’s annotated and unedited autobiography? It’s the stuff rose edited down, I think. I hope to get into it in the next month, and can’t wait. Haven’t yet read that–it’s one of the treats I’m saving for after revisions are done & the book is in next month. Ooh, I wil have to check out those books – thanks for the titles! Fellman is dinner; McClure’s book is dessert. Remember! I, uh, may have bought that for my library (it’s women’s history!) and have it stacked near my bedside table… it’s so BIG that it’s a little ungainly for bedtime reading though. Right on! I saw a copy of it for sale last year in Vroman’s Books in Pasadena, back when there were all kinds of stories about how the publisher couldn’t print enough copies to satisfy, etc. Should have bought it then–I’m sure it was a first edition! Yeah, I bought it for the library after all the publicity, so it’s not a first edition, but then, that’s not really a criterion for our collection. I should really either read it or turn it in — probably not cool of me to hog it. Willa Cather’s Shadows on the Rock might be interesting, there may be some overlap between Cecile’s and Esther’s experiences, if only in that they may have been in a similar time and place. I need to read Death Comes for the Archbishop once my ms. is in to the press. . . This reminds me that someone once gave me a Little House journal with NON-GARTH-WILLIAMS ILLUSTRATIONS. I think I still have it somewhere, but it just looked…. wrong. I think my mom (who didn’t read the Little House books as a girl) gave it to me, and I didn’t have the heart to explain that i DID NOT KNOW WHO THESE PEOPLE WERE. It’s amazing how sharply tied the Williams illustrations are to the Little House experience. I know! I think it’s a great example of how the materiality of the book makes a huge difference beyond even the crucially important text. I heard about a decade ago that one publisher was reissuing the books without the GW illustrations because they thought the pictures dated the book & made it less interesting to turn-of-the 21st century readers. But wait: THEY’RE BOOKS ABOUT THE PAST. F^(k those non-Garth Williams-illustrated books. Ain’t NOBODY got time for that. I can’t quite bring myself to get rid of the journal b/c it’s a gift from my mom (it’s taken us a long time to get to a good relationship). But it definitely does underscore that she didn’t read the books as a girl herself, or she would have known that THESE ARE NOT THE INGALLSES. And yes, Garth Williams’ representations of the material-cultural life of the family is integral to their appeal. Think of the drawings of the Christmas presents — the little cakes, the striped candy, etc. — all the domestic labor, but also the battle with nature (that scary image of Laura having washed over the plank bridge). I was on the Betsy-Tacy listserv (as is/was Wendy McClure) back when I was in grad school, and there are Very Strong Feelings there about the illustrations (must be Lois Lenski for early years, Vera Neville pompadour heaven for the high-school years) and the ALL WRONG cover images perpetrated by publishers in order to appeal to more modern readers. When again, part of the appeal of the Betsy-Tacy books, especially the high-school books, IS the stylized Vera Neville representations of turn-of-the-century girls and boys. I just finished reading Susan A. Miller’s Growing Girls, about nature/camping in the early Girl Scouts/Camp Fire organizations, which ends in the 1930s; since she writes a lot about these organizations’ emphasis on “pioneer” activities (and “racial exercise”), I found myself wondering about relationships between girls who did grow up reading the Little House books and wanted to be “pioneers,” how that might relate to Girl Scouting later in the 20th century. I’m sure that’s been written about by someone. Sophylou, I think *you* should write that book on Scouting in the 1970s and 80s and how shaped it was by the Little House books and TV show. If not you, who else? I also loved Lois Lenski books as a child. Some were even more foreign to me than the LIW books, because of their depictions of poverty. (Not that the Ingallses had it easy–but LIW and RWL worked to obscure the NON-self-sufficiency of the Ingalls family in the Little House books, whereas I recall Lenski writing about sharecropper children and children in the depression with the intention of revealing the reality of their hardships. This thread really helps illustrate why LIW was my model for The Many Captivities book: girlhood just hasn’t been a big concern of historians by comparison to the many historical books on American girlhood that we’re talking about here. This is so interesting, and it leads me to ask two more questions: how do you think about the illustrations for your own book? I asked to include 10 images in my book (not having really thought about it much when I got the contract! ), and have ideas for a few, but am not even sure how to think through what to include. I always like photographs, drawings (early 20th century for me, so some newspapers included both photos and drawings), and editorial cartoons, but certain artifacts are interesting as well. I’m starting to think about how they will all fit together with the historical information I’m presenting as well as the arguments I’m trying to make. Also, is there another space where people have these kinds of conversations, some other good “here’s how to write a history book” blogs or even books? I would happily purchase such a book if you wrote one. af: thanks for your comment! I don’t know about any books about “how to write a history book.” I think we should just keep talking about it on this blog, and crowdsource the question. Other blogs that talk about the craft of history? Theresa Kaminski at Theresakaminski.com has written a lot recently about her process and decision-making as she brings her third book in for a landing, Angels of the Underground: The American Women who Resisted the Japanese in the Philippines in World War II Megan Kate Nelson at Historista writes about this too. Although a lit scholar and not a historian, Flavia at Ferule and Fescue always has interesting insights and conversations with readers about questions of writing and scholarly practice. And Liz Covart of the podcast and blog, Ben Franklin’s World, is always talking to historians in her podcasts about how and why they wrote their books. I think there’s a lot of high-quality free advice out there and a lot of conversations happening that you could jump into and contribute to a great deal. Your question about illustrations makes me think I should write a new post on this topic. . . hmmmm. My main advice for authors is to treat your illustrations just like you do your textual evidence: analyze them and show the reader why & how they show something important about your argument. Don’t assume that they speak for themselves, and don’t include them just to show a few pretty pictures. I’m reading a book now that’s pretty lavishly illustrated, but the author isn’t interpreting the images as aggressively as ze could, so it feels like kind of a waste that the author & publisher paid for permissions and to get good quality images. I asked for (and GOT) a lot of illustrations b/c of my book’s analysis of material culture. My readers for the press demanded them, especially! 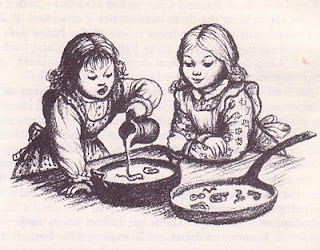 I think that’s why some of us remember the Garth Williams illustrations as such a vivid part of our experiences of the Little House books, because they were tied to a specific material object, sensual evocation, or physical experience described in the text, as Sophylou suggests above. I’d also like a book about how to write a history book. But like Historiann, I rely on models. Since I’ve been on vacation this week, I’ve been thinking through this particular topic, too, and will write a full blog post on it when I return. For me, the key has been place more than physical items. And one of my models–or inspirations– has been John Demos’s The Unredeemed Captive, in which he writes: “But most of all, I wanted to tell a story.” That’s as close to a how-to that I’ve found. Thanks for chiming in, Theresa. Please link to me and/or email to let me know when your new blog post is up so that I can let others know! You’ve touched on something that I think is a real challenge for any historian–how to write in a compelling way about undocumented, or scantily documented, lives. One model I admire is Rhys Isaac’s Landon Carter’s Uneasy Kingdom. Isaac was writing about the Virginia planter Landon Carter, and drawing on his copious journal, but he also managed to portray, as flesh-and-blood people, several of the slaves on Carter’s plantation who make brief appearances in the journal. Using imaginative sympathy and deep knowledge of the period, Isaac used material culture and peripheral sources such as much later oral histories of slave lives to piece together a convincing and picture of what life for those enslaved people was like. The Storyboard site has lots of great practical advice on writing narrative nonfiction that is worth reading for historians. Thanks, Peter! I have always loved Rhys Isaacs–from The Transformation of Virginia to his last book. I think it’s his anthropological sensitivities that made him so great–and his insistence that wealthy whites should also be subjected to that kind of scrutiny, not just Native or African American people whose lives are not nearly as well-documented with traditional historical sources. I’m going to add your blog to my blogroll–it looks terrific. Peter, your post has super advice! Relevance to the narrative arc should be the compass, but I too well know the temptation of adding a fact that took special effort to find…. Crossover works have so much potential to draw readers to history who wouldn’t otherwise read it. I’m writing at the moment about a murderer in the Mexican-American War, which gives me the chance to cross over into the true crime genre. That’s been lots of fun!